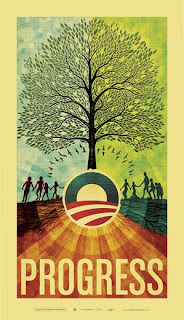 Poster by Scott Hansen, a participant in the Artists for Obama series. There was a time not too long ago when my life was lived in stop motion, seasons slowly slipping away as I sat on the couch and breastfed my twin sons. From my living room window I witnessed my neighbor’s yard burst in bloom, daises and tickseed unfurling petal by petal. Months later I was still on the couch nursing and watching as flowers faded and trees dropped their curled, yellow leaves into the cool grass. On those days that nursing sessions melted into hours, and I feared my brain was being sucked out through my breasts because I couldn’t remember what day it was, my neighbor’s Thursday habit saved me. She’d emerge from her cottage to care for her yard, and when I saw her I’d breathe, remembering the week was almost over and soon my husband would be home to help. Then I’d settle back down into the couch, nurse some more, and sing my daughter the nursery rhyme “Mary, Mary, Quite Contrary,” because by then I’d learned it was also my neighbor’s name. When my babies began to toddle, I pulled myself out of the permanent dimple I’d made in the couch and went outside to dig in my own garden. With one baby on my back, the other fenced in the grass, and my 3-year-old daughter equipped with her own small shovel, I moved rosebushes and toppled fences, wreaking havoc in the yard and sowing sanity in my mind. The crash and splinter of rotten wood, the ripping of root from its earth made me smile, and I’d wave at Mary from across the street and ask her opinion on where to plant my catmint and whether grapes would fare as well in my yard as they did hers. Life was no longer tick … tick … ticking in slow animation. I could leave the house with three small children and not panic, as long as I confined my errands to stores with shopping carts (to contain the kids) or to garden shops (where they could run freely without attracting attention or disapproval). How do the Democrats grow? And Obama signs all in a row.